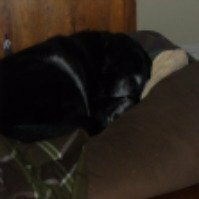 He was a great dog never showed his pain always willing to do things for you never barked smart happy. When he turned 14 he started showing signs of pain until one day he couldn't move his back legs sadly we had to get him put down .. R.I.P Charney. Never forget you big fella!